A few days ago I saw a blue FEMA tarp still on a roof here in Houston. These tarps were all over right after Hurricane Ike in 2008. I believe Galveston still has a number of homes with the tarps still in place. But I have not taken any pictures of those tarps. While you can’t see it very well in this picture, the word FEMA is visible at the top of the tarp. Here is the FEMA website. People often need help after a disaster. 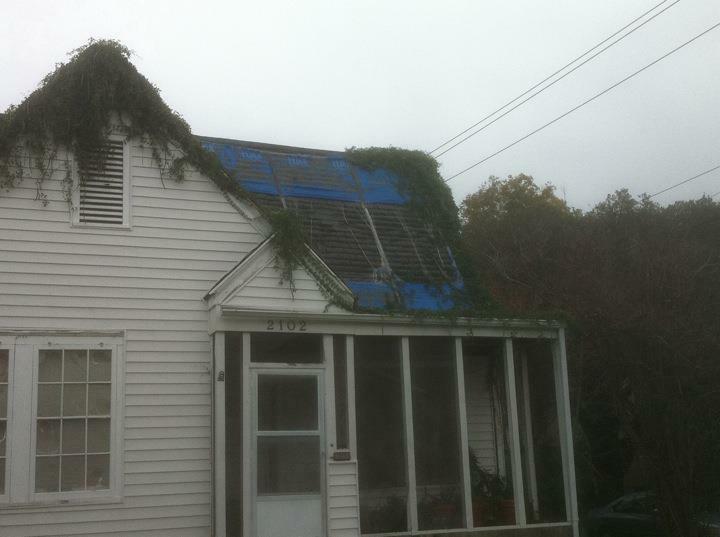 The tarps come from FEMA’s Operation Blue Roof. Here are facts about this program. Here are facts about Hurricane Ike. Here is a great photo essay of Ike from the Boston Globe. After Ike is a book of pictures from the air of damage done by Ike. I have this book. It’s interesting enough of you lived in areas impacted by the storm. The college basketball Final Four will be played in Houston. The event begins on Saturday, April 2 and ends on Monday, April 4. What should folks visiting Houston do while in our city for the Final Four? 1. Thank every person you see in Harris County for helping to pay for Reliant Stadium. Even if the money comes from car rental and hotel taxes, it is still money that belongs to the people of Harris County. Our county has a big budget shortfall right now that will involve vital services being cut. Still, even if some folks can’t get mental health counseling anymore , we at least have plenty of taxpayer subsidized sports facilities. People at the games are free to start chants in favor of socialism as they enjoy the Final Four. 2. Arrive in Houston early and attend the Harris County Green Party fundraiser to be held at 8:00 PM on Thursday, March 31 at Bohemeo’s. Bohemeo’s is located at 708 Telephone Rd. in Houston. We deserve other options than just the two major parties. 3. Visit our newly renovated Downtown Houston Public Library. The library had plenty of books for you to read. 4. April 4th marks the 43rd anniversary of the assassination of Martin Luther King. ( Please click here for the best Martin Luther King Reading & Reference List on the web.) The well-known Rothko Chapel features a sculpture outside the building that honors Reverend King. The Rothko Chapel is located at 3900 Yupon Street. 5. Drive 50 miles down the road and visit Galveston, Texas. 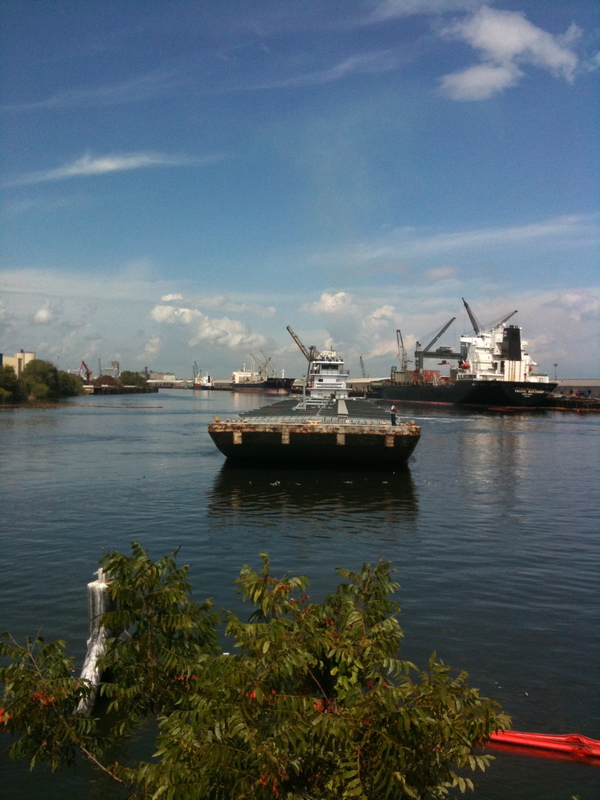 There is a lot of history in Galveston and there is plenty to do. 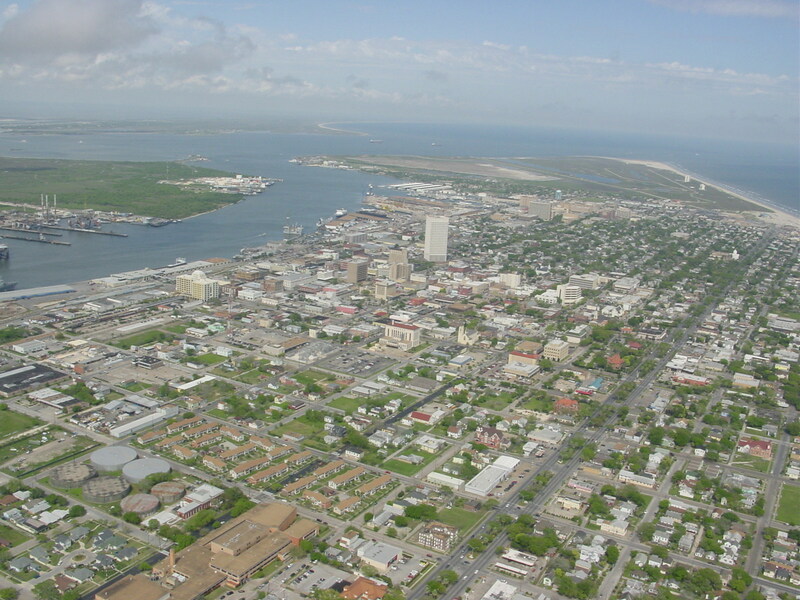 Galveston is working to recover from Hurricane Ike and your visit will be most welcomed. 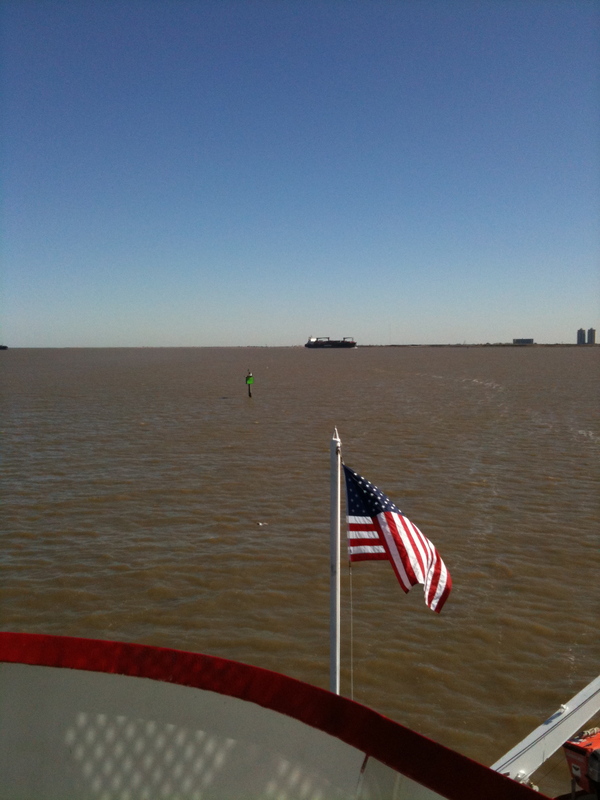 One of the very best attractions in Galveston is the free Bolivar Ferry. 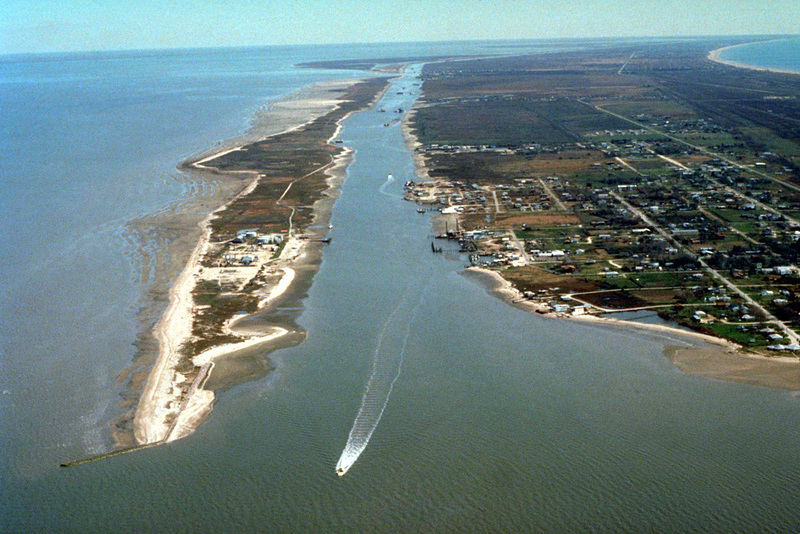 This boat trip runs about 25 minutes each way between Galveston Island and Bolivar Peninsula. You can park the car and walk on board. Or you can drive on and explore Bolivar. The Bolivar Chamber of Commerce thinks the ferry is wonderful. I’m glad to see this Chamber favors the Texas Department of Transportation money that keeps the ferry free to all. In any case, provisional on your ability to drive in a civilized fashion if you are renting a car, and contingent on your willingness to tip well given that you have enough money to attend these basketball games, welcome to Houston. A terrible earthquake and strong aftershocks have hit our hemispheric neighbors in Haiti. Above is a picture from the disaster. UNICEF has made an emergency appeal for help for Haiti. A hospital has collapsed and poorly constructed buildings and homes have been destroyed. 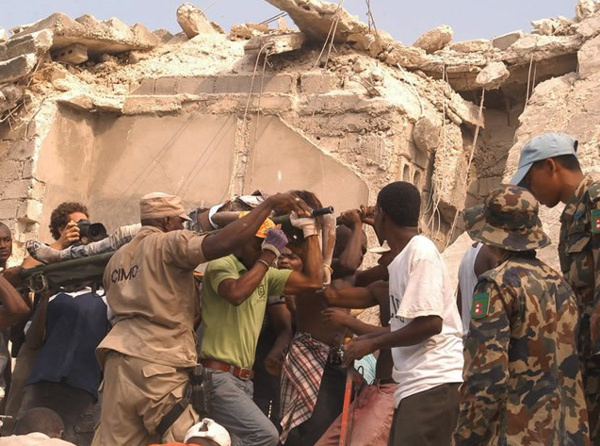 The resources do not exist in Haiti to build things up to earthquake-proof standards. Haiti was already the poorest nation in our hemisphere. Here is information about earthquakes. We hear about earthquakes, but do we know what they are? Haiti has often been struck by natural disasters. Hurricane Ike, which did so much damage in the United States in 2008, was one of four hurricanes to hit Haiti in that year. A big cloud of dust has been reported over the Haitian capital of Port-au-Prince. since the earthquake. This cloud is thought to have been kicked up by structures knocked down by the earthquake. Here is a link to an extensive history of Haiti. Haiti was founded in 1804 by black people–former slaves— who won independence from France. Here is a profile of Haiti from the BBC. Most of us are able to write a least a small check for earthquake relief in Haiti. Think of all the things we waste our money on in day-to-day life. Here is a link to a list of groups taking money for earthquake relief in Haiti. 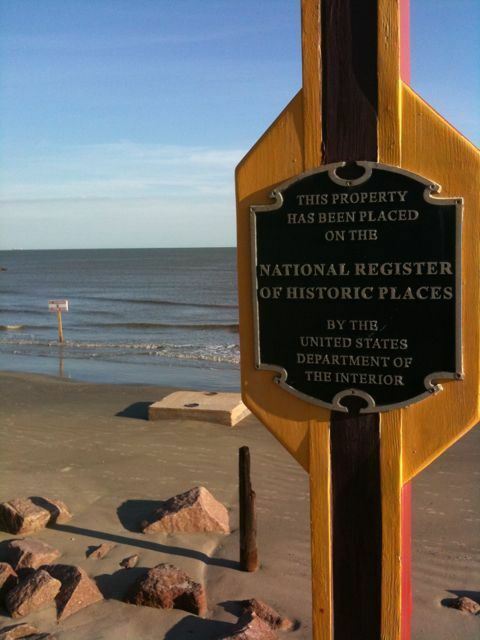 Below you see a marker where the Balinese Room once was on Galveston’s Seawall. The Balinese Room was once a swinging spot. The marker says the location of the Balinese Room was placed on the National Register of Historic Places by the U.S. Interior Department. While this may well indeed be the case, it is also so that Hurricane Ike washed the Balinese Room away in 2008. This is why you see nothing but beach and the ocean behind the marker. Things come and go in life and sometimes all you have left are memories. Above is a one minute video I filmed in front of the 1900 Galveston Hurricane memorial statue. At the time I shot this video, there was a temporary display up around the statue marking the one year anniversary of Hurricane Ike. In this video, I make the point that I am aware of the past. It is important we be aware of the past. The past provides context for what is taking place at present, and provides clues as to what may happen in the future. It is easy to dupe the public at-large, or an individual, when they are not aware of the past. All events, whether in your personal life, or in the wider world, have some context. Please take some time to consider what aspects of the past are relevant to your present and your future. Please consider what it is you could learn about the past that might help you understand why the world is the way it is today. Here is information about the 1900 Galveston Hurricane. 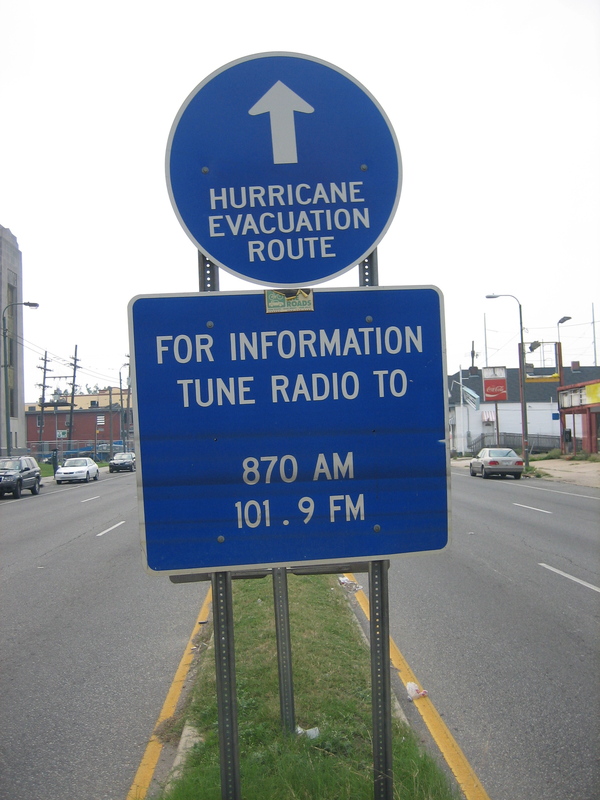 Here is information about Hurricane Ike’s impact on Galveston and the Texas Gulf Coast. Here is a video in which I ask you to be flexible of mind, and to see many meanings at once in whatever it is you may be looking at in life. At the same time, I ask you to see no conflict between something having many meanings and one specific meaning all at the same time. This video will take but 48 seconds of your time. Behind me is a smashed fishing pier from Hurricane Ike. I am in Galveston, Texas in this video. I am standing in front of the wave-swept pier and in front of the Gulf of Mexico. The book I reference in the Penguin Dictionary of Symbols. Am I A Real Texan? What Makes Someone A Texan? In addition to this blog you’re reading, I’m also a featured politics reader-blogger at the Houston Chronicle. At that space, I’ve often been criticized by readers for not being a native Texan. They say I’m a carpetbagging Yankee. This reader was writing in response to my post that Texas Republicans are talking treason. Am I a real Texan? What makes a real Texan? I was born in 1967 in Worcester, Massachusetts. I did not live there long. Between 1968 and 1980 I lived in Providence, Rhode Island. Below you see a picture I took last year of the Providence hurricane dam. Just as I could tell you about Hurricane Ike, my father could tell you about the 1938 New England Hurricane. While living in Rhode Island, I was a Rhode Islander. While living in Ohio, I was an Ohioan. From 1998 until the current day I’ve lived in Houston, Texas. Below is my windswept rainswept Hurricane Ike photo of a flooding Buffalo Bayou to show that I do live in Houston, Texas. What am I while living in Texas? You got it!— I’m a Texan! It does not matter that I spent 13 years in New England or that I lived for 18 years in the Midwest. All that I need to be a Texan is to live in Texas. I’ve been a Texan for 11 years. Texas has 24 million people. No one thing defines all these people except the fact that they live in Texas. 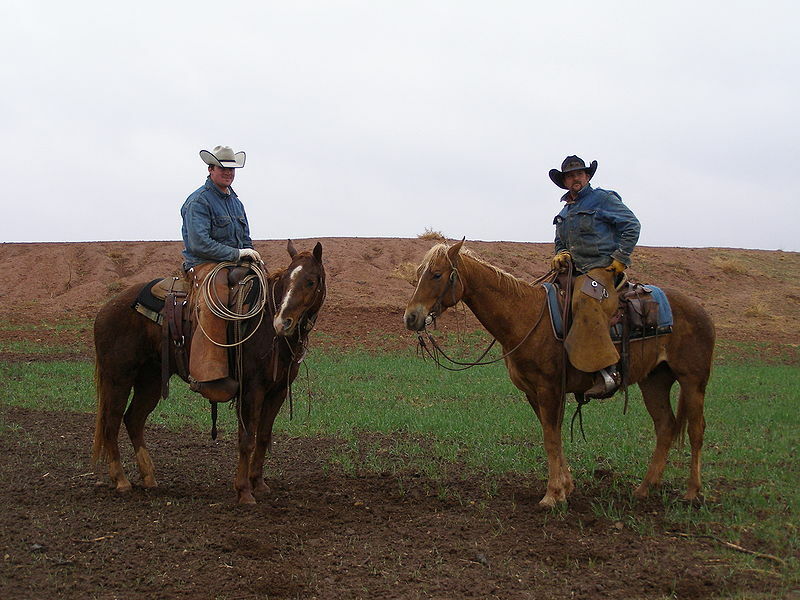 Definitions of what makes someone a “real Texan” or a “true Texan” are sure to leave many people out. All I’ve got to do to be a Texan is live in Texas. If what you see below is your image of a Texan, you are free to have that thought. But when you try to impose that notion on others, I’m afraid I’m going to have to ask you to ride off into the sunset. Above is a picture of a room at the Flagship Hotel on the Seawall in Galveston. Now those are rooms with a view. The Flagship was damaged by Hurricane Ike. This picture was taken just a few weeks ago. The hurricane was in September. I’m sorry that the Flagship was damaged and that people who worked there have lost their jobs. But I’m not sure the Flagship was very nice. The Flagship had been renovated in recent years, but every time I walked by it I could see evidence of poor or non-existent maintenance on the grounds of the hotel. I’d see people driving to the place to check in, and I’d think that they were paying hard-earned money for a place that was not so nice. Below you see where the driveway to the Flagship was once located. There is a small walkway beyond the former driveway, but the driveway is washed away. I wonder how long it will be until someone comes and cleans up this damage. There are nice places to stay in Galveston and it it worth your time to visit Galveston. There is still damage from the hurricane, but repairs and improvements are being made even as we speak. Please click here to review what you can do in Galveston. Hotels were originally conceived as a way to shelter and control strangers — a growing preoccupation in a country whose citizens were becoming among the most mobile people in the world. Foreigners remarked on the unusual and easy freedom of movement Americans claimed as a birthright; indeed, it seemed a hallmark of a democratic society. Anyone (except blacks and Jews) could go wherever he wanted. Sandoval-Strausz dates the inspiration for the creation of the hotel to the first presidential tours of the new colonies, from 1789 to 1791; to avoid the appearance of favoritism, George Washington insisted on staying in inns and taverns, converted houses with liquor licenses. His accommodations from New Hampshire to Georgia, when they were available, were for the most part dirty and uncomfortable; it was not uncommon for guests to share beds swarming with insects. Local burghers were so embarrassed by the reports of shoddy hospitality that they began to finance the construction of large, lavish public accommodations, the better to receive notable visitors to their cities. Here is the first Texas Liberal video. I filmed it on Galveston’s East Beach a few days ago. It is just under 2 minutes long. The video explains why I am making videos for the blog. The video expresses the idea that I have confidence in you because of the things that you and I have in common. Not in the video is the rotting dolphin carcass that was about 30 feet away from where I was standing. At first look, people thought it was a seal carcass. 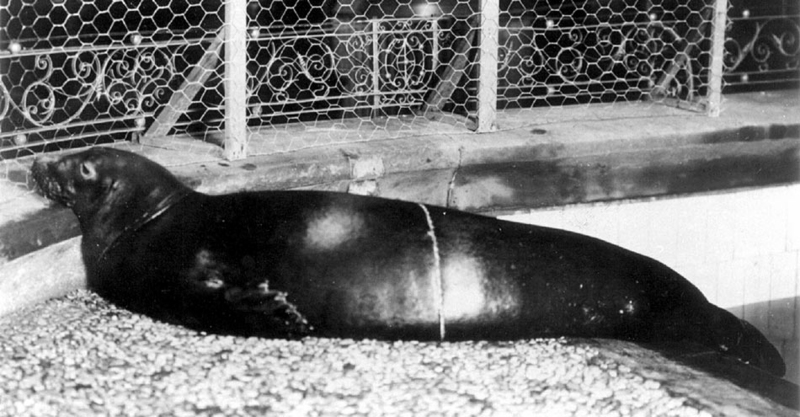 Don’t folks know that the only seal ever to come near Galveston was the now-extinct Caribbean Monk Seal? (Below) This was the only seal native to the Gulf of Mexico. Why do you think that people must drive big pickups onto the beach and motor around in circles? I’d like people to please know that I kept my eye on the camera despite these trucks, the dolphin carcass, the many bulldozers replenishing the beach with sand after last year’s Hurricane Ike, and people feeding seagulls out of moving cars as the seagulls followed the cars in noisy flocks. Thank you for reading this blog and for watching the video. Ron Paul Joins The Socialist Movement—Welcome Aboard! It’s easy to say you oppose the bill and vote against the bill when you know it is going to pass. What would have been the real test for Rep. Paul would have been to not add any projects to the bill. If you know it is going to pass, you know that by adding projects you will be increasing the cost of the package. I’m glad to see that big government is on the move in the United States and in Texas. People can whine and moan, but in the end they know that it is only government that can do big things such as fixing the Galveston Seawall and the Intracoastal Waterway after a hurricane. With the support of people such as Representative Paul here in Texas, I know that this movement of big government will be very hard to stop even after the recession ends. Also, in addition to Congressman Paul, let me please thank former President George W. Bush for messing up so bad that he made this all possible. I’ve been waiting really all my life for a government that works for average folks and now finally it seems we have that chance. Hurricanes Not A Rainy Day Expense? The malignancy known as the Texas State Legislature must decide if it should make more cuts to state programs, or dip into the nine billion dollar rainy day fund to help pay for expenses related to Hurricane Ike and two other hurricanes that impacted Texas last year. Above—Not a rainy day. 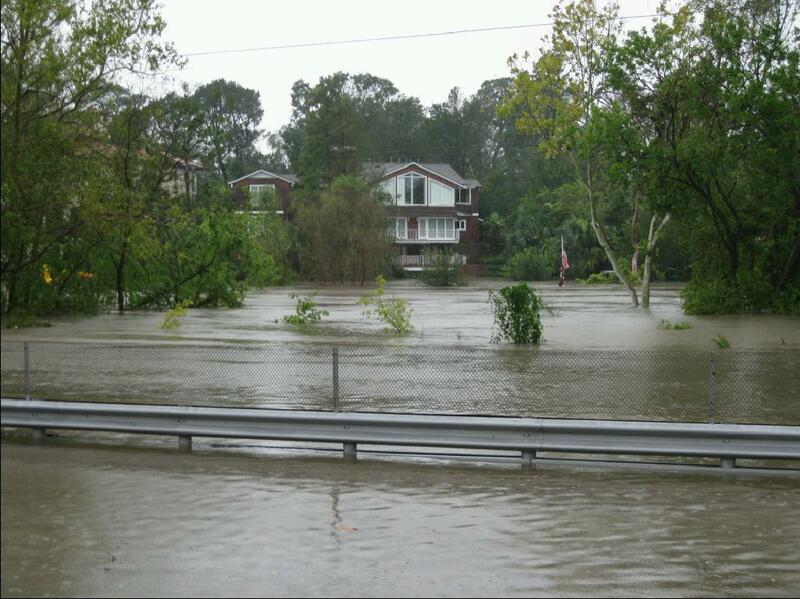 Hurricane Ike flooding not far from where I live in Houston. The idea that we would even consider cutting services in this already barbaric state because we had a hurricane that came and did people a lot of damage is….well, that idea is just Texas for you. This is indeed a dire report. But wouldn’t it be wonderful if our own internal defenses from the batterings life offers could be restored with some sand and a few dollars? You’d be worn down from life, but have the knowledge that it could be fixed and you’d be back up and running. We all have our internal reserves, and for many of us they are quite strong and resilient. We also have people in our lives who help us out. There are beliefs we can call upon. 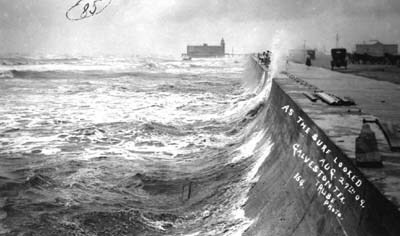 Still, it would be good to know that when we simply run out of steam, that there was a fix such as the plan to secure the Seawall after over 100 years of hard work protecting Galveston. Here is some good information about the Seawall. One way to get rid of a Hooters is to have a hurricane come and blow it away. This is what happened in Galveston, Texas with Hurricane Ike. I got this picture from Wikipedia. I wish I had taken the picture because it is a scene I have walked past twice since Ike. But I did not take the picture. I can’t recall if the Hooters was located where the there is nothing over the first set of wooden beams, or if it isthe damaged structure behind the beams. I think it is was where there is nothing at all. There had been place called the Ocean Grill at this spot. It was there for at least 5 or 6 years— Maybe longer. I went there sometimes and sat out on the balcony that overlooked the ocean. It’s so hard to find peace in the world and this was a place I found some peace. One time I went there and intended to read a book of Martin Luther King sermons while I ate lunch. The hostess noticed my book and made a comment about how it looked interesting. I gave her the book. I don’t say that to make out like I’m some great guy. It’s just that each time I walked past the Ocean Grill—I visit Galveston from my home in Houston every six or seven weeks—this is what I thought about. I thought about the young woman I had given the book to and about Martin Luther King. Then the Ocean Grill closed and a Hooters opened up. Oh, how I hated that Hooters. I’m sorry about all the trouble Hurricane Ike caused. But I am glad the Hooters is gone. Not surprisingly, with Galveston, Texas a long way from recovery after Hurricane Ike, casino gambling is on the table for the island. Here is Dolph Tillotson, President and Publisher of the Galveston County Daily News, writing in favor of casino gambling. Many business owners in Galveston are hoping that casino gambling is part of the future. For this gambling to be allowed in Galveston, it would have to be allowed in Texas in the first place. Above you see staphylococcus aureus. It is the most common cause of staph infections. 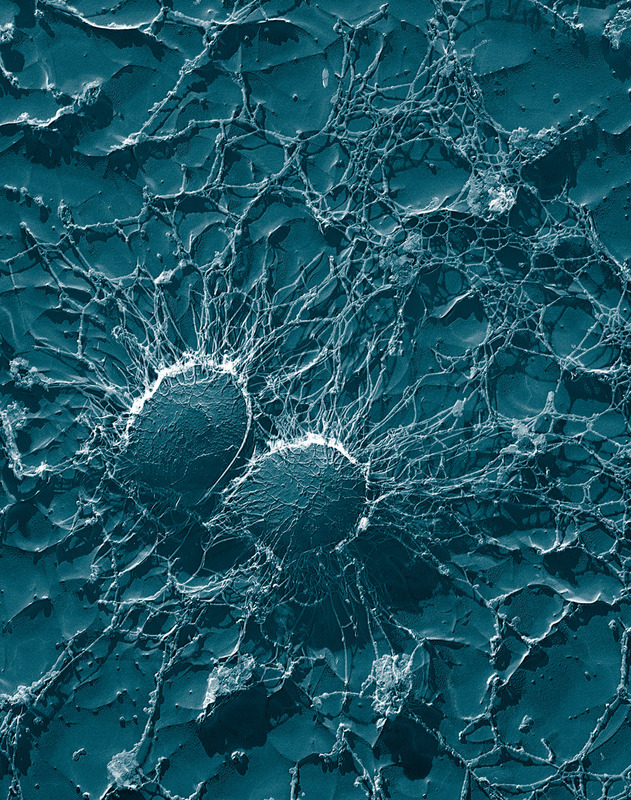 About 20% of people carry this bacteria. It does not kill in most cases. Though it can kill. For the most part, it causes a variety of troubles for the victim that can range anywhere on the scale from major to minor. Staphylococcus aureus will do it’s damage when you give it a chance. It takes advantage of wounds and disease. It’s the cause of opportunistic infection. Casino gambling is the same way. It moves in when there is no more hope of an economy producing anything of real value. Or when local or state governments cannot or will not raise enough tax money to provide basic services. It sees its opportunities and it takes them. It is always waiting for its chance. In the case of Galveston, casino gambling finds opportunity in the wake of a hurricane, and as the island’s largest employer, the U. of Texas Medical Branch, slashes thousands of jobs. In honesty, because I don’t see another option, I’d favor at least considering this gambling in Galveston. I don’t have another solution to help people in Galveston find work. Nobody is going to help them. The liars who comprise the U. of Texas Board of Regents are doing everything possible to hurt the island for who knows what reason. Yet though I think casino gambling preys on those least able to afford it, and that it is a lousy way to fill the public coffers, it seems at this point the people of Texas and Galveston should vote on the issue. Galveston will no doubt talk about regulating the casinos, but when they move in the people will lose control of their city government. Though since this little city of 50,000 has no control over hurricanes, of course, or over UTMB, what does it really matter? Maybe I’m being pragmatic here. Or maybe I’m just fatigued trying to think about what will serve as a solution to help what I view as the most interesting and enjoyable place to visit in all Texas. If somebody has a better idea I’d like to hear it. I’m certain the people of Galveston are very fatigued right now. I’m certain fatigue makes one more vulnerable to the type of opportunistic infection that casino gambling represents in any community that has run out of better and more hopeful choices. This made me think about all the people who did not evacuate New Orleans before Hurricane Katrina or Galveston before Hurricane Ike. It was clear from news reports that many who stayed behind were very poor. If folks don’t feel they have a better option but to stay and take their chances, they will quite possibly not evacuate when troubl is on the way. I think this is one of those cases where you have to be in the other person’s shoes to fully understand. Though it is certainly easy, as I heard many times here in Houston after Hurricane Ike, to sit high and dry and criticize others. All I can say in reply is that if people are telling you that they are not going to get out of the way of bombs and hurricanes, I bet they have a good enough reason. At least in the context of their lives and their experiences in life, they have a good enough reason.